While visiting the southern part of the island, you can see an entirely different kind of scenery from that of northern Okinawa, which is covered with thick forest for the most part. A number of battle sites, war memorial monuments and various historic sites that reflect the rich Ryukyuan history are located in southern Okinawa. Southern Okinawa is characterized by the typical landscape of fields of sugarcane stretching for miles. This area offers many golf courses and beautiful beaches with shower and toilet facilities including Mibaru Beach, Azama Sunsun Beach, Bibi Beach Itoman and Toyosaki Chura Sun Beach. Numerous cafés with spectacular views have recently been opened up along the coast, and the area has become popular as an ideal place for a leisurely drive. Two new hotels recently made their debut in southern Okinawa: Hyakuna Garan, a 15-room luxury resort near Mibaru Beach, and the Ryukyu Onsen Senagajima Hotel, featuring natural hot springs. Called Agarikata in olden times, meaning “east in which the sun rises,” southern Okinawa is dotted with sacred sites and spiritual places remembered historically as places of worship during the Ryukyu Kingdom era. If you're seeking a spiritual experience, take the pilgrimage route in southern Okinawa, which covers such places as Seifa Utaki, the Tamagusuku Castle ruins and the Chinen Castle ruins. Seifa Utaki, designated as a UNESCO World Heritage Site, is believed to have been the supreme sacred place in the days of the Ryukyu Kingdom. Pick out sightseeing attractions that you would like to visit and explore southern Okinawa your own way. Nanjo City is affectionately known as “heart town” because of its unique shape, best seen from the air. Besides the popular Seifa Utaki, one of the top tourist destinations in Okinawa, Nanjo City offers a wide variety of places of interest, including Okinawa World, Gyokusendo (limestone cave) and Azama Sun-Sun Beach, to name a few. 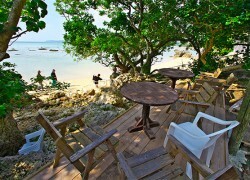 In addition, Hyakuna Gran, The Yuinchi Hotel Nanjo and more accommodation options are available. Located off the coast of Nanjo City is Komaka Island -- a small, uninhabited island ringed by beautiful white sand and having a circumference of 800 meters. You can take a ferry to Komaka and also to Kudaka Island from the Chinen Ocean Leisure Center, located right next to Azama Suunsun Beach. In the past, Itoman was famous for its uminchu (fishermen) who would sail their traditional Okinawan fishing boats known as sabani to such places as Singapore, Java and Sumatra in search of a catch. During the voyages, uminchu encountered severe storms that tipped over their sabani. Itoman is also known for its unique agya method of fishing where 30 to 40 uminchu on board seven or eight sabani chase schools of fish swimming on the seabed into a net. Scattered around Itoman City are a variety of historic sites, such as the Okinawa Peace Prayer Park and Himeyuri Monument as well as a number of popular tourist attractions, including Bibi Beach Itoman, Ryukyu Glass Craft and more. Densely populated urban residential areas are spread around Yonabaru Town, Haebaru City and Tomigusuku City, all located in the vicinity of Naha City. Tomigusuku City offers a variety of places of interest, including the Japanese Navy Underground Headquarters, Senaga Island and Toyosaki Chura Sun Beach. In addition, the town's coastal area is a popular shopping destination among tourists, dotted with large shopping centers as well as the Ashibinaa outlet mall. 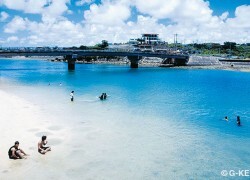 Haebaru City is the only municipality in Okinawa that has no coastline. Haebaru is known for its traditional shishimai (lion dance) that has been passed down through the generations in Miyahira. 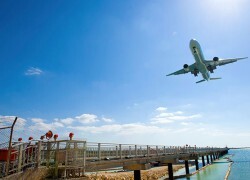 The Tomigusuku-Nakachi exit of the Naha Airport Expressway is the nearest exit to the airport and also a convenient way to get to downtown Naha, meaning most visitors to Okinawa will go through Tomigusuku City one way or another. The main highways in Yonabaru Town and Haebaru and Tomigusuku cities are lined with shopping centers, drugstores and a number of spots for dining out. Kudaka is a small island with a circumference of 7.75 kilometers located five kilometers east of the Chinen Peninsula in Nanjo City. This island is said to be the first island created by Amamikiyo, the creator goddess of the Ryukyus, when she descended from the heavens. Kudaka Island, known as the island of the gods, is considered one of the holiest places in Okinawa, and in the old days the kings of the Ryukyu Kingdom made a pilgrimage to the island every year. Kudaka is also known for folk traditions and culture that thrive even in the present day. 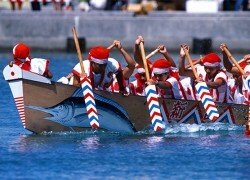 Including the Izaiho festival held every 12 years in the Year of the Horse, a number of festivals and sacred rituals are performed in their original forms on the island. Komaka Island is a small, uninhabited island ringed by beautiful white sand beaches and with a circumference of only 800 meters. The island is located about 15 minutes by ferry from the port at Chinen Ocean Leisure Center, situated right next to Azama Sunsun Beach in Nanjo City (round-trip fare: 2,500 yen). A popular remote-island getaway, Komaka is crowded with people who enjoy sea-bathing, diving, snorkeling and beach parties. In summer, you can camp under a star-studded sky. The waters surrounding Komaka Island are amazingly clear, boasting a transparency of some 20 meters. Near the beaches, you can enjoy snorkeling and see many colorful tropical fish contrasting with the white sand bottom. 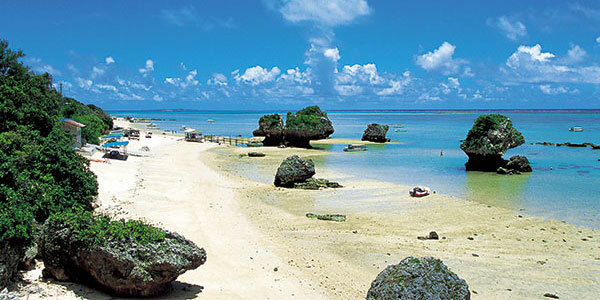 Ou is a small island located south of Okinawa Island. 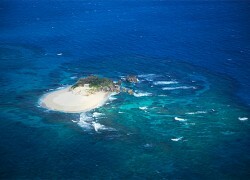 With a perimeter measuring only two kilometers, it takes just five minutes to drive around the island. This island is connected to the main island of Okinawa by an approximately 100-meter-long bridge situated close to Miibaru Beach. The waters around Ou are calm, and the west side of the island is known for its scuba diving, which people can enjoy there despite rough seas elsewhere. 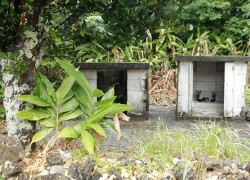 The island is a 40-50 minute drive from Naha Airport.